2018 was an eventful year for RegTech, especially with regard to public and private sector collaboration. Technology companies and government agencies made strides in working together and promoting the use of advanced technology, like AI, to automate and streamline the complexity of the regulatory environment–particularly for the financial sector. 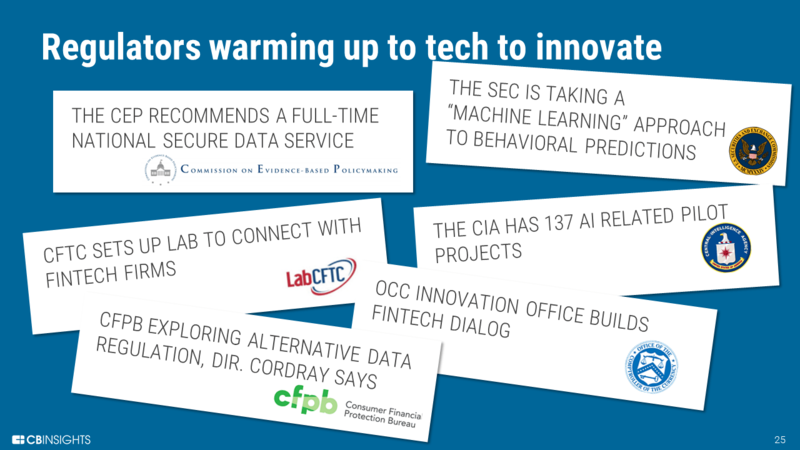 FINRA provided guidance on RegTech, the OCC and CFTC promoted innovation hubs referred to as sandboxes, and globally, the FCA hosted TechSprints and hackathons to find technology solutions to the most pressing challenges. All of this market development and government partnership is very promising for RegTech companies like ours. 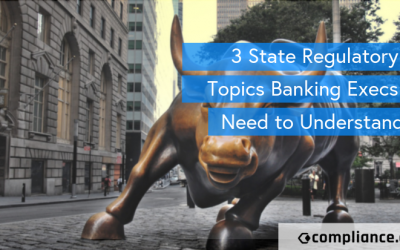 In addition, banks began to shift from attempting to develop regulatory technology in-house to using specialized RegTech services with configurable and integratable solutions. What will 2019 have in store for the financial sector? 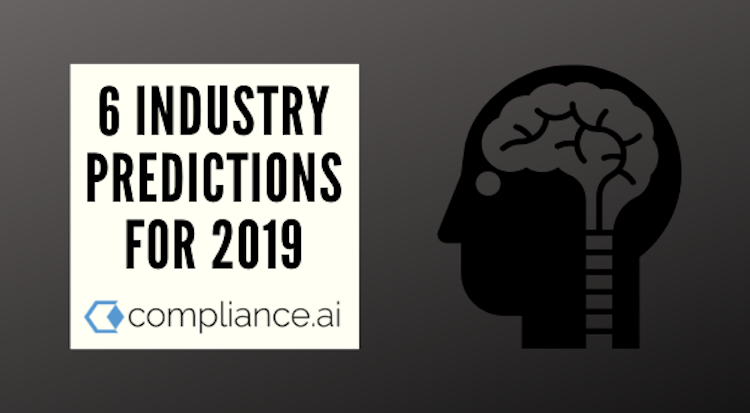 Here are six predictions from our Advisors and Compliance.ai team. In June 2018, California passed a sweeping new data privacy law called the California Consumer Privacy Act (CCPA), which goes into effect on January 1, 2020. CCPA gives California consumers three things: 1) ownership over their data and the right to tell businesses not to sell or share their data 2) control over the personal information that is collected about them and 3) assurance of data security and the right to hold businesses responsible for safeguarding their personal information. California is the 5th largest economy in the world and now surpasses the economy of the United Kingdom. CCPA will impact 39.5 million Californians. More significantly, it will have a ripple effect across the United States—because where California goes, the rest of the country follows. For instance, Amazon and other global companies that do business in California will have to comply with the CCPA, and it would be impossible for them to manage different privacy rules for each state. Instead, they will need to adopt the CCPA as the new standard across the United States. 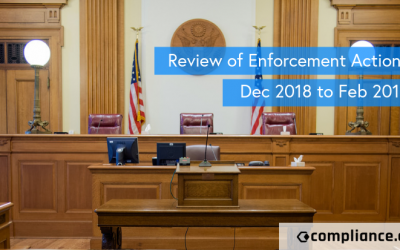 While CCPA does not go in effect until January 1, 2020, companies will need to get started on their enhanced compliance plans now. 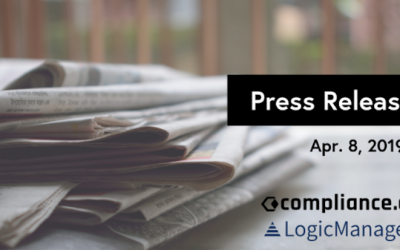 A PwC survey of 300 executives at U.S. companies with revenue in excess of $500 million shows that 86 percent of respondents rank CCPA compliance as a top business priority, but only half expect to be compliant by the time the law goes into effect. 2. There will be a significant slow down in financial deregulations. Given the results of the 2018 midterm elections and the new face of the House of Representatives, we predict that the new regulatory environment will stand in stark contrast to the first two years of the Trump administration, which were marked by a series of high profile Obama-era rollbacks. Hugh Cadden, co-founder, and CEO of the Institute for Regulatory Training is watching for some “long overdue market regulation initiatives” in 2019. He says: “2019 just may be the year that the SEC, CFTC and Treasury finally take a hard look at the market structure issues that have been largely unaddressed in the wake of Dodd-Frank and the Financial Crisis – lack of liquidity; payment for order flow; exchange and participant conflicts; data fees and dissemination, and the NMS to name a few. 3. AI solutions will have to be more transparent, and more firms will demand an audit for 3rd party AI applications. While the use of AI in financial services will continue to grow, companies will require increased scrutiny into how the technology was developed, the specific individuals involved in developing the algorithms and the audited results at how decisions were made. “Black box” AI systems that don’t provide transparency into how the technology works will face resistance and pushback. Compliance.ai has been on the cutting edge when it comes to AI transparency. Our Expert-in-the-Loop methodology (as opposed to unsupervised, deep learning approach) provides transparent references and links to the source of truth at all times. 4. 2019 is the year banks go big with blockchain. While Bitcoin and other cryptocurrency had a dramatic rise and fall in 2018, blockchain is here to stay. We predict 2019 will be the year that blockchain comes into its own, and we expect to see broad adoption by global banks this year. Blockchain provides many advantages that make it very attractive to financial institutions, including increased security, reduced fraud, lowered transaction fees, transparency and transaction integrity. In addition, blockchain simplifies non-repudiation. 5. Financial regulators will start using AI-solutions to improve the way they collaborate with each other, publish new regulatory content and they work with financial services institutions. New AI-powered RegTech solutions are designed to distill and classify high volumes of regulatory content into tangible intelligence and streamline compliance activities. This relatively new category of technology has matured quickly in its breadth and depth of features and is now recognized as an essential tool for both financial regulators and the financial services institutions they regulate. In 2019 we’ll see an increasing number of financial regulatory bodies publicly evaluate RegTech solutions in “sandbox trials,” and ultimately formally adopt a RegTech solution of choice. 6. Companies will begin to measure leaders based on codes of conduct–focused on harassment and ethics–in light of ongoing #MeToo scandals. We’d love to hear your feedback on these predictions and learn what you see when looking into your crystal ball for 2019. How Accurate were our 2018 RegTech Predictions?